This tab is used for creating and producing delivery notes, as well as for loading any existing delivery notes. Each delivery note has a unique serial number and may include several items from several orders. Load Document - as will be described below. 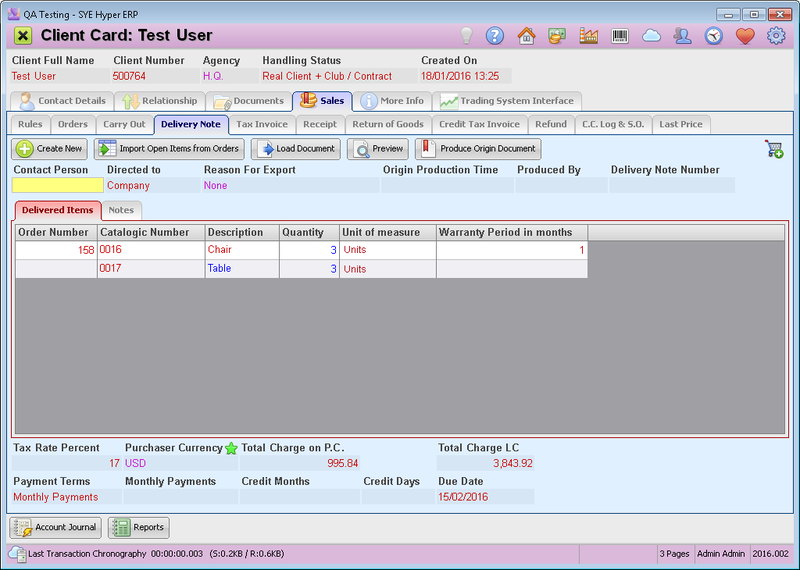 The fields at the top of this screen are used to define the addressee of the delivery note as will be described below. Please Note - additional information fields can be added by the user. The delivery Items table presents the selected products for this delivery note as well as descriptions and quantities. At the bottom there are additional information fields according to the user's needs and requirements. This button allows to print a certified copy of an exist delivery note. Also, according to the definition of the "Send Official Documents to Primary Email" field in the client card, the certified copy will be sent to this Email address. The "Previous / Next Record" buttons allow the user to browse through the records of the produced delivery notes. The system allows to cancel delivery notes (according to authorizations), as will be described below. Retrieve a Canceled delivery note and any inventory transactions associated with it, as discussed in the section of Cancel / Retrieve Document. In order to create a new delivery note, press the Create New button. This action will clear the delivered items table. The Import Open Items from Orders window will display all of the items that are ready to be delivered. Choose the required items for this delivery note, Check / Un-Check the check boxes and press the OK (F6) button. The selected items will be added to the "Delivered Items" table. Please note - the Open Items from Orders table displays only the items that were defined as "Ready for Supply" in the Carry Out tab. The fields at the top of the table are used to define the addressee of the Delivery Note. The "contact Person" field is used to choose a person that will be mentioned in the "Intended for" title of the document, while the "Apply To" title will be referred to the company. If the Delivery Note should be referred to the contact person, choose "Contact Person" in the "Direct to" field. In the "Reason for Export" field, choose a comment to be displayed on the document, describing the reason for the export. This action will also change the language of the document to English. Delivered Items - By using the Import Open Items from Orders button, the user can choose products from the list of items that were defined as ready for supply. In the "Import Open Items from Orders" window, select the required products and press the OK (F6) button. The selected items will be added to the "Delivered Items" table. Products can also be added to the table by using the Add Product button. This button will open the "Select a Product" window, where the user can search for the required product and add it to the delivered items table. Alternatively, press Ctrl+Enter to add a new row and manually fill in the required fields. Notes - After choosing the required products for the delivery note, the user can add notes to be printed on the produced document. The user can also use this tab to modify the Client details (for this document only). After adding the required products to the delivered items table, press the Preview button, to verify the document details. Press the Produce Origin Document button to produce the delivery note. Please note - delivery notes of not ordered products, will not be displayed in the "Import Open Items from Orders / Delivery Notes" window in the Tax Invoice tab. Load the delivery note, using the Load Document button. Press the Cancel Document button. This button is available according to authorizations. In the Notes tab, you can find the Cancellation time, Cancellation Reason and the name of the user that made the cancellation. The Canceled Delivery Note can be retrieved by loading it and pressing the Retrieve Document button. In order to add a default note/comment to the delivery notes, open the Agencies tab of the system fundamentals, and fill it in the "Default Notes for Local Delivery Note" field. Please note - this note is applied to the selected agency only (from the agencies table). If any additional copies are required for produced delivery notes, open the Bookkeeping tab of the System Fundamentals and fill in the "Print # copies for every Original Delivery Note" field. In order to start the numbering of the delivery notes from any specific number, open the Bookkeeping tab of the System Fundamentals and fill in the "Number Delivery Note From" field. The system will start the auto numbering from this number. Organizations and companies that work with foreign clients and foreign currencies, are sometimes requested to convert the prices to the client's currency. Open the Bookkeeping tab of the System Fundamentals and select "YES" in the "On International Doc Convert To Purchaser Currency" field, in order to allow the system to convert the rates.